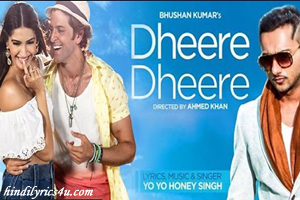 Lyrics Of Dheere Dheere Se Meri Zindagi From Album - Dheere Dheere (2015): A romantic track sung by Yo Yo Honey Singh featuring Sonam Kapoor, Hrithik Roshan. Features: Sonam Kapoor, Hrithik Roshan. The video of this song is available on youtube at the official channel T-Series. This video is of 5 minutes 03 seconds duration. Lyrics of "Dheere Dheere Se Meri Zindagi"
Lyrics in Hindi (Unicode) of "धीरे धीरे से मेरी ज़िन्दगी"
Amazing, nice singing by Yo Yo Honey Singh!! hrithic looks stunning!